When Matt Knight left his career as a spay to marry the woman of his dreams, he thought he was in for a life of domestic bliss. But after adopting a baby girl and her teenage brother from China, he finds that being a father comes with its own set of challenges—problems for which his work as an antiterrorism agent did nothing to prepare him. Or so he thought. When a Scout campout with his teenage son takes a terrifying turn, Matt realizes his past and present have just collided, with devastating consequences. Deep in the rugged mountains of Utah, a band of mercenaries lies in wait. The target: Matt Knight. Their orders come from a dangerous enemy from the former agent's past, one who is bent on destroying everything Matt holds dear. While struggling to protect his son and the other Scouts, Matt is horrified to learn the full extent of the plan: his wife and baby have been taken too. Now the agent-turned-family-man must draw on his years of combat training in an explosive battle to save those he loves—or die trying. Frank Holdaway has been a fan of action thrillers from the time his father handed him an Alistair McLean novel at the age of ten. Since then, he has delighted in finding a tale that can take him from airport departure gate to destination hotel and back to long-term parking in such a state of engrossed concentration that he is in danger of missing his shuttle stop. When he’s not lost at the airport, he enjoys creating stories that he hopes will cause others to miss their bus. He currently lives with his wife and two kids in the foothills of Pleasant Grove, Utah. Thanks for the great read ! ( listen ). I don’t have much time to sit and read, so listening has been great for some holiday fiction. This was well written, didn’t get begged down and had nice believable characters I warmed too. The plot was great and well executed. Well written and great narrator! I sure hope this author has more books in him! Great character development, twists and turns in the plot, and funny. Hours of pleasure with light but insightful gospel themes and contexts. I want more! Please write another one!!! It had a lot of excitement, thrill and kept you on the edge of your seat! It also had great family values! Definitely worth a read or listen!! This book has everything all in one. Action, adventure, suspense, humor, charters you are emotionally invested in. Plus a action book that if full of family, friends and faith. 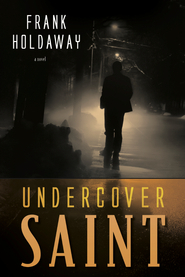 I read the first book, Undercover Saint, and really enjoyed it, so I was excited to see what this author could come up with next. I didn't realize that this story is about some of the characters from Book 1; it can stand alone, although it is handy to know the backstory. There are a few angles that this story follows, as characters are in different places. Each side of the story is brilliantly well done. The tension, suspense, and teamwork brought surprising twists to the story. Things happened that completely took me by surprise and I wasn't expecting the culmination of events. I love a book that can take normal, everyday people and thrust them into situations that are realistic, yet not the kind that you really want to have happen. These characters are resourceful, yet ordinary, and have so much dimension to them. I wasn't expecting so much growth and so many bonds to develop. This is a great read for those who enjoy action suspense thrillers without all the gore. Content: some violence (there are deaths, shootings, kidnappings, peril, but nothing is graphic); mild innuendo and vague talk of sexual abuse/human trafficking. Clean. What a fantastic story. I was hooked from the first page and had a hard time putting it down. The tension and suspense kept me on the edge the entire time. Everything from the adoption to the campout to the explosive battle at the end was extremely well done. Each character had a very unique, believable personality that planned an important role in the story. This is an exciting read that any and everyone would love, especially those suspense, adrenaline junkies, thriller people out there. I will definitely be finding his other book. I loved this book! Make sure to grab your own copy! This book caught my attention from the very beginning. I love the way that the author writes. There were several parts that caused me to laugh out loud, I loved the way that humor was included in this type of book, it's especially helpful in a tense scene. I liked Matt, he's an ex-antiterrorism agent, doing his best with his family. He's got an amazing wife, Hope, who always knows just what should be done. He's got a 15 year-old adopted son, Peng, who is an escape artist and that Matt really doesn't understand. And then there's sweet 2 year-old Jin. He's the adviser in the teacher's quorum, to a group of 4 boys including Peng. Matt has a unique sense of humor and he uses humor to get himself through sticky situations. Peng was great too. I loved the way he was always watching out for Jin and his best friend, Shi Shi. I liked the way he wanted to get away from everyone because he felt like he was not good for anyone around him, but instead of running away he stayed to keep all of his promises to his birth mother and also to his adopted mother. I also loved the man that Matt worked with in the teacher's quorum, Ron, he is a great guy and he always tries to get those boys to grow in anyway that he can. I loved how he was able to trick the bad guys. The plot of this book is full of action, adventure, and subterfuge. Holy cow! I loved the way that there was action after action and I had no idea just what was going to come next. I loved the way that the villain in this book new pretty much everything about the hero and he was able to goad him just a little bit. Make sure to grab your own copy of this great book!